For orders with personalised measurements, we are able to take your measurements for you. This additional service costs £25 per garment and already includes our Made to measure charge of £12. This service is offered on selected garments only, a list of which can be found below. All you have to do is customise your online order under the section "Made to measure" and select the Measurement for fit option. 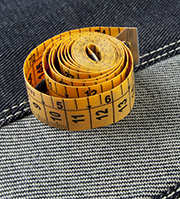 Send to us a pair of your best fitting trousers/jeans for us to take the measurements. Please refer to Contact us section of the website for our address as you will need to send your garment to us so that we can measure it for you. We will tailor make your garment in your preferred style, with your measurements. We will then return the original garment to you, with the made to measure garment. Please note, that delivery will take upto 14 days.